The American Red Cross in Northeast Wisconsin will host the 19th annual Soup’s On presented by Jack’s Maintenance Friday, November 2, 2012. This year promises to be full of fun and excitement and, as always, one distinguished restaurant will earn the coveted Platinum Soup Ladle trophy and bragging rights for an entire year. This highly5:30 to 8:30 p.m. at the Grand Meridian, 2621 N. Oneida Street in Appleton -anticipated event will be held from. Not only does the fun-filled evening raise vital funding for the American Red Cross, it highlights the many local services provided to our community, including disaster response, community disaster education & prevention, services to armed forces at home and abroad, life-saving skills training and the Shopping and Errand program which serves disabled and elderly community members. Each year area chefs and restaurateurs present either a classic soup or a custom creation of divine flavors with maximum crowd appeal. This year’s competitors include: CSI Appleton, Fox Valley Technical College Culinary School, Grand Meridian, Kangaroostaurant, Mark’s East Side, Michiels Fox Banquets, Plum Hill Café, Remington’s at the Holiday Inn Neenah Riverwalk, Shellatte’s, Stone Cellar Brewpub, Van Abel’s of Hollandtown and Zuppas. Throughout the evening, each attendee’s palate serves as the judge for their favorite soup, votes are cast and the platinum “Ladle Award” is presented. Additional tantalizing treats throughout the evening include appetizers compliments of McCain Foods, grilled cheese sandwiches from Simon’s Specialty Cheeses, Simple Simon Bakery desserts, Great Harvest Bread, Culver’s Frozen Custard and Wilmar’s chocolates. The evening’s Master of Ceremonies will feature Skip Willis from WVBO radio and music will be provided by Fran the Piano Man. Community support is also provided by numerous area businesses that support the silent auction. Fabulous prizes include jewelry, artwork, golf packages, vacation travel, sports memorabilia and so much more! New this year is the Mission Moment, in which you can help raise $5,000 toward the purchase of a disaster trailer that will be filled with special needs cots, medical supplies and equipment. Please, help us ensure that we can quickly get these supplies to a shelter with a donation in the amount of $50, $100, $250, $500 or $1,000. Corporate sponsors of Soup’s On include: Presenting Sponsor, Jack’s Maintenance Service; Diamond Sponsor,Kimberly Clark Corporation; Gold Sponsor, SCA Tissue; Silvers Sponsors, Boldt and Thrivent Financial for Lutherans; and Bronze Sponsors, Agropur, Bassett Mechanical, Festival Foods and Outlook Group Corp.
Tickets can be purchased in advance for $45 or at the door for $50. Reserved tables are also available. Tickets can be purchased by calling (920)-733-4481, by visiting the Red Cross at 1302 E. Wisconsin Ave., Appleton or by visiting the redcross.org/newisconsin website. The Northeast Wisconsin Chapter serves 20 counties with a mission to prevent and alleviate human suffering in the face of emergencies by mobilizing the power of volunteers and the generosity of donors. To learn more about local Red Cross programs, volunteer opportunities, and how you can help, contact the Chapter headquarters at 920-231-3590 or visit redcross.org/newisconsin. Find us on facebook.com/newredcross, twitter.com/newredcross, the local blog is newredcrossblog.org and event photos will be at flickr.com/photos/newredcross. WASHINGTON, Wednesday, October 31, 2012 — In the aftermath of Superstorm Sandy, thousands of people from more than a dozen states have turned to the American Red Cross for help and trained disaster workers are responding with food, shelter and comfort. THE RED CROSS RESPONSE With communities throughout the Mid-Atlantic and Northeast suffering from widespread power outages, wind damage and significant flooding from Superstorm Sandy, the Red Cross has provided more than 23,000 overnight shelter stays since Saturday. Tuesday night, more than 9,000 people stayed in 171 Red Cross shelters across 13 states. On the ground, the Red Cross has more than 2,300 Red Cross disaster workers from all over the country who have served more than 100,800 meals and snacks. The Red Cross has activated nearly 200 emergency response vehicles that are beginning to circulate through some communities distributing meals, water and snacks. While access into many areas is still difficult, the Red Cross is working hard to get help to where it is needed. As roads and airports re-open and people are able to travel again, more Red Cross disaster workers, vehicles and relief supplies will be arriving. HOW TO HELP THOSE AFFECTED “The Red Cross needs both blood and financial donations as this large response effort will continue over the next several weeks,” Shimanski said. Approximately 300 Red Cross blood drives have already been cancelled due to the storm, and more are expected. This represents a loss of as many as 10,500 blood and platelet products. The Red Cross is urging immediate blood and platelet donations in areas where it is safe to do so. To schedule an appointment, please go to redcrossblood.org or call 1-800-RED CROSS. Financial donations help the Red Cross provide shelter, food, emotional support and other assistance to those affected by disasters like Hurricane Sandy, as well as countless crises at home and around the world. To donate, people can visit www.redcross.org, call 1-800-RED-CROSS, or text the word REDCROSS to 90999 to make a $10 donation. Contributions may also be sent to someone’s local Red Cross chapter or to the American Red Cross, P.O. Box 37243, Washington, DC20013. COPING IN THE AFTERMATH While residents will be anxious to return home, families and individuals should go back to their neighborhoods only when officials have declared the area safe. Drive only if necessary and avoid flooded roads and washed out bridges. Stay out of any building that has water around it. Before reentering homes, residents should look for loose power lines, damaged gas lines or other hazards that pose dangers. Beware of snakes, insects and other animals that may be in or around the home. Avoid drinking or preparing food with tap water until you are sure it’s not contaminated and check refrigerated food for spoilage. If in doubt, throw it out. Two local American Red Cross volunteers are leaving this morning for New York to help feed victims impacted by post-tropical cyclone Sandy. Sandy hit the East Coast on Monday, leading to an estimated billion of dollars in damage, millions of people without electric power, thousands of flight cancellations, extreme flooding and at least 17 deaths. Ginny Gibson of Iron Mountain, Mich., and Donna LaPlante of Little Suamico, will take an emergency response vehicle on a 17-hour drive to the East Coast. The women are expected to arrive late Wednesday in Middletown, N.Y., where they will then be directed to help residents in an area impacted by the storm. The response mission is expected to last from two to three weeks. Southern Baptist disaster relief teams will prepare meals, and the women will then deliver the food to neighborhoods that have been damaged. “It’s such a rewarding experience to help and give someone a warm meal who hasn’t had a warm meal for days,” Gibson said, adding she has previously responded to several natural disasters, including helping victims of Hurricane Katrina in 2005. On Tuesday, the women helped load the vehicle with bedding, water and equipment at the American Red Cross offices at 121 Bader St. On the drive there, the volunteers expect to face road closures, downed trees and severe weather. More than 3,000 American Red Cross volunteers nationwide are responding to the East Coast, Hansen said. Seven volunteers and one employee from the eastern region of Wisconsin already have responded, and another 15 volunteers are on standby to travel to the region once travel restrictions have been removed. About 30 American Red Cross volunteers from the eastern region of Wisconsin helped in Gulf Coast relief efforts after Hurricane Isaac hit in late August, Hansen said. “It’s our job to anticipate and prepare for these types of disasters. This is what we do,” he added. The storm canceled about 100 blood drives in the East Coast region on Monday and local residents are encouraged to donate blood, Hansen said. — cedavis@greenbaypressgazette.com and follow him on Twitter @pgcharlesdavis. Nearly 11,000 people spent Monday night in more than 250 Red Cross shelters across 16 states including New Jersey, New York, Pennsylvania, Connecticut, Rhode Island, Maryland, Delaware, Virginia, West Virginia, North Carolina, Massachusetts, Vermont, New Hampshire, Maine, Indiana, and Michigan. These numbers could increase as the storm moves into cities like Chicago, Cleveland, Detroit and Milwaukee with heavy wind, rain and snow. The Red Cross has mobilized 1,700 disaster workers from all over the country who have served more than 25,000 meals and snacks so far. We have also activated167 response vehicles and shipped in more than 230,000 ready-to-eat meals. This is a huge disaster, bigger than any one organization can handle and the Red Cross is working closely with multiple partners including a variety of civic groups, advocacy organizations, professional organizations and houses of worship to share their expertise and volunteers. SAFETY AFTER THE STORM In areas hit by this storm, the Red Cross urges people to check on their neighbors, make sure everyone is okay, and take care of each other until help arrives. Everyone should follow the direction of their local officials during this disaster – evacuate if told to do so, stay in a safe place and off the roads until the storm is over, and do not return home until officials say it is okay. To find a Red Cross shelter, people can download the Red Cross Hurricane app, visit the Red Cross web site, call 1-800-RED CROSS (1-800-733-2767), or check local media outlets. People can let their loved ones know how they are by using the “I’m Safe” button on the Red Cross Hurricane App which can be found in the Apple App Store and the Google Play Store for Android by searching for American Red Cross. People can also register on the Red Cross Safe and Well website to let loved ones know they are okay. To register, visit http://www.redcross.org or call 1-800-RED-CROSS (1-800-733-2767). With more than 7 million people without power as of Tuesday morning, residents should take precautions to ensure the safety of themselves and their loved ones. For those without power, surround food with ice in a cooler or refrigerator to keep food cold for a longer period of time and keep the refrigerator and freezer doors closed as much as possible. Use flashlights, not candles. Residents should also turn off and unplug all unnecessary electrical equipment and any appliances, equipment or electronics that were on when the power went out to avoid damaging them when the power is restored. Finally, eliminate unnecessary travel, especially by car as traffic lights will be out and roads congested. FINANCIAL AND BLOOD DONATIONS NEEDED “The Red Cross response to Sandy is very large and will be very costly, affecting a massive area spanning much of the eastern half of the country. We need the public’s help now,” said Shimanski. Financial donations help the Red Cross provide shelter, food, emotional support and other assistance to those affected by disasters like Hurricane Sandy. To donate, people can visit http://www.redcross.org, call 1-800-RED-CROSS, or text the word REDCROSS to 90999 to make a $10 donation. Contributions may also be sent to someone’s local Red Cross chapter or to the American Red Cross, P.O. Box 37243, Washington, DC 20013. Approximately 300 Red Cross blood drives have already been cancelled due to the storm, and more are expected. The Red Cross is urging immediate blood and platelet donations in areas unaffected by this storm and asks that people in the affected areas consider donating blood once the storm passes through and it’s safe to do so. 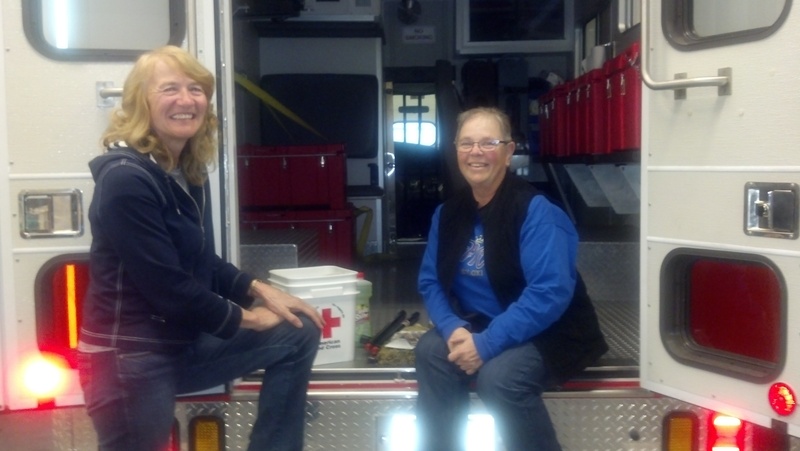 (l-r) Donna LaPlante, of LIttle Suamico and Ginny Gibson, of Iron Mountain, getting ready to head to NY with the Red Cross Emergency Response Vehicle. MARINETTE – New York City and Marinette, Wis., are 1,100 miles apart but what’s happening with Hurricane Sandy out there is having an impact on people and decisions being made here in northeast Wisconsin. The American Red Cross in Northeast Wisconsin has already shifted into gear. Two volunteers from the region, Kathy Brockman of Kaukauna and Barbara Behling of Madison, are in position to help. Brockman is working at a shelter in the New York area and Behling is assisting with public affairs in Washington, D.C.
“Right now we are under a travel restriction,” said local Red Cross spokeswoman Jody Weyers. “We’re waiting for ‘Sandy’ to actually make landfall so we can assess what the damage is and then deploy people according to the needs and where the needs are.” Weyers said calls are also being made to registered disaster volunteers to find out who is available to head out for a two to three week assignment. Once the travel restriction is lifted and damage assessments are made, the deployment process will begin again. At 8:30 this morning, Ginny Gibson of Iron Mountain, Mich., and Donna LaPlante of Little Suamico will leave Green Bay for New York State in the Emergency Response Vehicle. As of Monday afternoon sustained winds in New York had reached 90 mph and are expected to go even higher as the storm pushes its way up the coast. “It sounds like it’s going to be the height of the storm when we get there,” said Gibson. “I’m a little apprehensive, sometimes you just don’t know what to expect. There’s a little anticipation going on.”Apprehension and anticipation, yes. But not enough to back away from someone in need. Gibson has been a Red Cross volunteer since 2005 and has answered the call to some of the most powerful and destructive storms in modern history. Gibson and LaPlante will report to Middletown, New York, about 75 miles north of New York City. They won’t know exactly what they’ll be doing until they report in at the Green Bay office. However, the vehicle they’re driving is designed to distribute meals ready to eat and to deliver hot meals to storm victims or to shelters. The vehicle is also used to deliver cleaning supplies and clean up kits. Historically, Wisconsin Public Service (WPS) has assisted other parts of the country in restoring power after major outages; however WPS has no plans to assist with Hurricane Sandy. Instead, WPS has released its contractor crews, including tree trimmers, to allow them to assist in the hurricane aftermath. “The reason why we’re not sending our crews is because we’re anticipating a lot of high winds in our area,” said WPS spokeswoman Jenny Short. A WPS forecast projected wind speeds of 30 to 50 mph winds beginning late Monday night. WPS said with winds that strong, it’s likely there could be downed lines from broken poles, trees and branches. 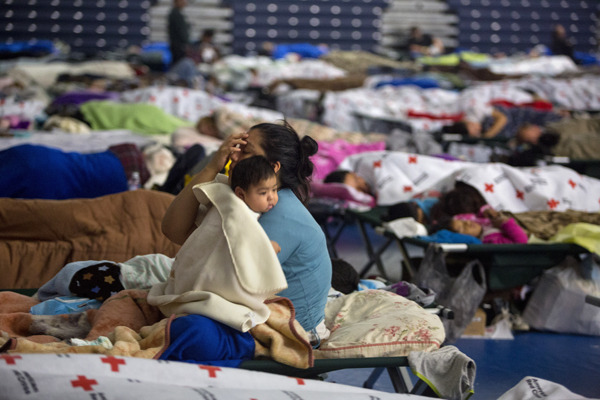 Thousands of people across nine states took refuge from Hurricane Sandy in American Red Cross shelters Sunday night as the massive storm neared the East Coast. 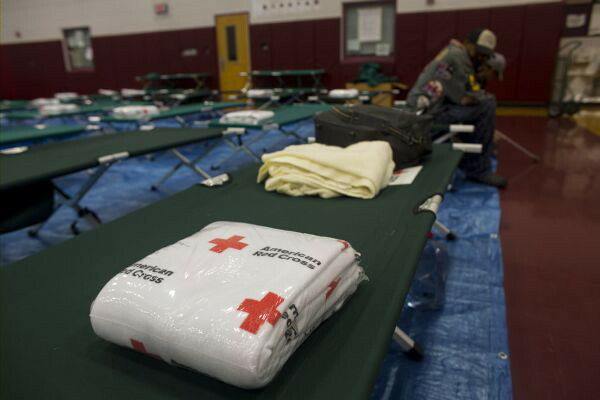 More than 3,200 people spent the night in 112 Red Cross shelters in nine states – New Jersey, New York, Pennsylvania, Connecticut, Rhode Island, Maryland, Delaware, Virginia and Massachusetts. The number of people going to shelters is expected to grow as the storm comes ashore. The Red Cross has deployed more than 1,300 disaster workers to the region from all over the country to help those affected by the storm. As many as 160 emergency vehicles are ready to respond when it is safe to do so, and more than 230,000 ready-to-eat meals have been sent into the area. People can also register on the Red Cross Safe and Well website, a secure and easy-to-use online tool that helps families connect during emergencies. To register, visit http://www.redcross.org or call 1-800-RED-CROSS (1-800-733-2767). This site also connects with the Twitter and Facebook accounts of users. BLOOD DRIVES CANCELLED Meanwhile, nearly 100 Red Cross blood drives have already been cancelled due to the storm, and there could be more as the week goes on. This means a loss of as many as 3,200 blood and platelet products. If anyone is eligible, especially in places not affected by the storm, they are asked to please schedule a blood donation now. To schedule a blood donation or get more information about giving blood, people can visit redcrossblood.org or call 1-800-RED CROSS (1-800-733-2767). To give blood, someone must be at least 17 years of age, meet weight and height requirements and be in general good health. Donors should bring their Red Cross blood donor card or other form of positive ID with them. Some states allow 16-year-olds to give with parental consent. Financial donations help the Red Cross provide shelter, food, emotional support and other assistance to those affected by disasters like Hurricane Sandy. To donate, people can visit www.redcross.org, call 1-800-RED-CROSS, or text the word REDCROSS to 90999 to make a $10 donation. Contributions may also be sent to someone’s local Red Cross chapter or to the American Red Cross, P.O. Box 37243, Washington, DC20013.